Programming Taskbook is intended to be used while learning programming languages such as Pascal, Visual Basic, C++, C#, Visual Basic .NET, Python, Java, Ruby. It contains 1100 learning tasks that cover almost all sections of a basic programming curriculumbeginning with scalar types and control statements to complicated data structures and recursive algorithms. Eclipse 4.2 Juno, 4.3 Kepler, 4.4 Luna (Java). Programming Taskbook is also a part of the PascalABC.NET programming system developed by Prof. S.S.Mikhalkovich (www.pascalabc.net). Starting from the version 4.12 the Programming Taskbook for MPIproblem book on parallel MPI programmingis available in Russian and English. Starting from the version 4.17 the Programming Taskbook for MPI-2problem book on parallel MPI-2 programmingis available in Russian and English. complete register of solved task as result of a series of successful test program runnings. Programming Taskbook sufficiently facilitates educational task execution. It is due to it performs automatically standard input-output operations unlike manual coding. Its advantage is especially obvious when performing processing of arrays, strings, files, and dynamic data structures. Submitting ready input data to students, Programming Taskbook directs their efforts to the development and program implementation of the algorithm of the task solving; and the variety of input data submitted by Programming Taskbook provides the effective testing of the offered algorithm. 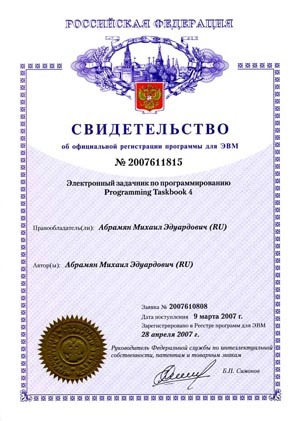 Programming Taskbook 4 is officially registered in the Software Register of Russian Federation on April, 28th, 2007 (the certificate No. 2007611815). Development of English version of Programming Taskbook 4 has been supported by European Consortium of Innovative Universities as a part of the joint Russian-German project "Supporting Assessment of Program Assignments" (SAPA) in 2006-2007. PT4Results shows information about the process of solving tasks; this information contains in the results.dat file. These tools are available from the Programming Taskbook menu "Start | Programs | Programming Taskbook 4". The shortcuts of these tools are created automatically in any working directory. Since the 4.11 version, the PT4Results tool is available directly from the Programming Taskbook window. Begin1Begin40, Integer1Integer30, Boolean1Boolean40, If4, If6, If8, If12, If22, If26, Case2, Case4, Case9Case10, Case18, For5, For12For13, For15For16, For19For20, For33, For36, While1While2, While4, While7, While11While12, While22While23, Series1, Series15Series17, Series19, Series21, Series30, Proc4 (Func25), Proc8 (Func29), Proc10 (Func31), Proc20Proc21 (Func5Func6), Proc25 (Func10), Proc40 (Func40), Minmax1, Minmax6, Minmax12, Minmax19, Minmax22, Array4, Array7, Array16, Array32, Array47, Array54, Array63, Array71, Array79, Array89, Array92, Array108, Array112, Array116, Array134, Matrix7, Matrix24, Matrix36, Matrix53, Matrix74, Matrix82, Matrix88, Matrix100, String9String10, String19, String29, String41, String44, String63, String70, File2, File10, File25, File27, File41, File43, File48, File50, File58, File61, File63, File67, File74, Text1, Text4, Text16, Text21, Text24, Text34, Text38, Text42, Text44, Text57, Param1, Param17, Param30, Param40, Param49, Param53, Param59Param61, Recur1, Recur4Recur5, Recur10, Recur14Recur18, Recur21, Recur25, Recur27, Dynamic2Dynamic3, Dynamic5, Dynamic8Dynamic12, Dynamic25, Dynamic30, Dynamic49, Dynamic55, Dynamic59, Dynamic63, Dynamic70, Dynamic74, Dynamic78, Tree2, Tree6, Tree9, Tree12Tree13, Tree32, Tree34, Tree40, Tree47, Tree49, Tree53, Tree59, Tree65, Tree70, Tree74Tree76, Tree79, Tree86, Tree92.